Travel insurance is a huge money maker for the travel industry because the people who purchase it will rarely use it. Just because it makes the travel industry a lot of money doesn’t mean it’s always a bad idea. When it comes down to travel insurance, it’s usually up to the buyer to figure out whether or not it’s a bad deal. If you’re considering travel insurance, check with your credit card company first because they may offer complimentary insurance if you make the purchase with their card. Not all cards offer this but many do and, like purchase protection and other benefits, it really pays to know what you get for free. You can spend the savings on your vacation! Citi® American Express® Cards – Citi AAdvantage, Citi Chairman, Citi Diamond Preferred Rewards, Citi Platinum, Citi Premier Pass, Citi Select AAdvantage. American Express also offers Trip Cancellation insurance included on some of their cards. Some of the cards were listed under Citi (Citi is the branded card, AMEX is the payments processor on those cards) but the insurance works in the same way – you usually get $1,500 per insured persons to a maximum of $3,000 for all persons combined if you cancel for a covered reason. In addition to the included coverages for trip cancellation, several American Express cards offer other travel related insurance coverage such as baggage insurance, AD&D insurance, etc. You can learn more about all the travel insurances American Express offers here. Chase has rolled out several cards that offer travel insurance, including their travel card – Chase Sapphire. 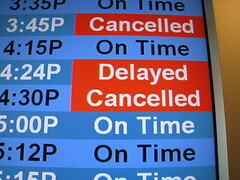 The cards that do offer this type of insurance often have the whole portfolio of insurances – trip cancellation insurance, auto rental collision damage waivers, travel accident and travel delay insurance, lost luggage, baggage delay, roadside dispatch and travel & emergency services (that’s an exact listing of the insurances available on the Chase Sapphire). The next time you go to book a trip, check to see if one of your credit cards offers complimentary travel insurance and save yourself some money!